I'm not entirely sure how to do this, and there are no plans - just a picture. Anyone have thoughts? Router? Jig? Something else entirely? The problem is that once you've cut your first curve you lose that side as a flat, square reference surface for cutting the second curve with a bandsaw/router. You can get around this easily by starting with your squared stock a couple of inches longer than the finished length. Draw the curves on the inside faces and cut out with a bandsaw. Don't cut (too much) into the extra lengths at each end - leave them square so you can use them to register against the bandsaw bed for cutting the second curve. You could also make the curved cuts with a coping saw in which case the extra lengths at the ends can be used for clamping. 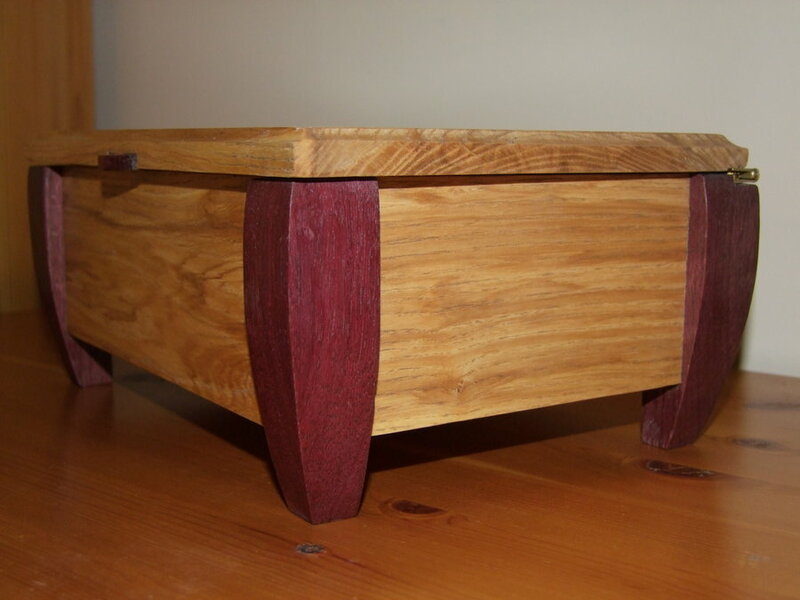 Finish by taking out the saw marks with a spokeshave or block plane and cutting to length. I guess the standard way to do this sort of thing these days is with a bandsaw. And keeping the first waste piece cut from each piece can prove very helpful with this method so that you can tape it back into position to provide support for the piece when you cut the second curve. As long as the wood isn't too hard or the legs too big I think you could do much the same using a scroll saw, even though they are not ideally suited to cuts of this kind. Not that I'd recommend it but the entire shaping job could be done using a belt sander, starting with a very coarse grit (i.e. nothing finer than 60). In theory the same basic method as used with the bandsaw could be used with any curve-cutting hand saw (e.g. jigsaw or bow saw) as long as you can work out a suitable way to hold the workpieces for cutting, using one or more clamps or a vice. Use a 2"/50mm chisel to hog off the bulk of the wood that needs to be removed and then refine using a spokeshave. Do all the work with a spokeshave. Relatively slow but definitely doable if needed. Scrub/roughing plane to waste the majority of the wood and then switch to a smoothing plane or block plane to complete the shaping. With a bit of practice this is a surprisingly fast method (only minutes per side) and if you do the smooth-planing well no further work would be needed on the curved surfaces and the legs would be ready for finishing. Use one or more rasps to remove the bulk of the wood, then switch to files to smooth. I wouldn't recommend this method as it would be the most labour intensive and slowest, but it is possible to do it this way if other tools aren't available. Make sure you've had your Wheaties that morning if you go this route! Regardless of the shaping method chosen as much final smoothing as is needed could be done with some combination of file work, scraping and sanding (sand using a firm block to protect against accidentally rounding corners). Obviously a stationary belt sander could be used for this as well if you have one. In all cases a cut out template in stout card or hardboard would be a very good idea. For the bandsaw method this becomes your master template to draw the required shape on each facet of every leg, and for the hand-tool methods it can be held against the legs during shaping to check progress. Having just completed a series of decorative boxes with many variations on your curved legs I found that the easiest way to establish the curves for small pieces was to mark the curves on the blocks and use a belt sander table to define the curves on each face. I can also see using a hand saw or band saw to cut the curves and then filing and sanding them to a finished surface. Not the answer you're looking for? Browse other questions tagged tools boxes or ask your own question. How can I hollow out a square hole in a solid piece of wood to make a box? What is an easy way of putting together a mitred box? 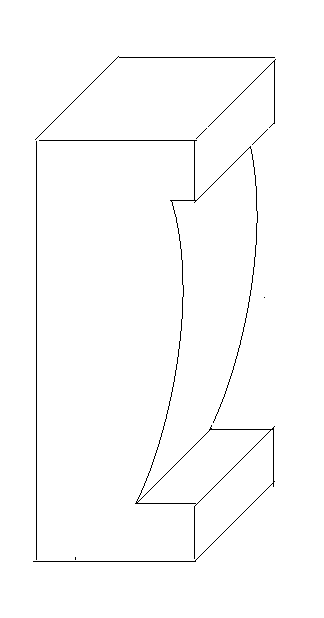 How can I copy the cut of a curved piece of wood?